As an alternative to collecting dust in the dry form as in bag filter equipment part of the dust can be collected as a slurry using Enviro Venturi Scrubbing Equipment. This is normally a two or three stage collecting system depending on the dust loading - the first stage would comprise a bank of cyclones for example. These would remove some 80% - 85% of the dust extracted from the process in the dry form. 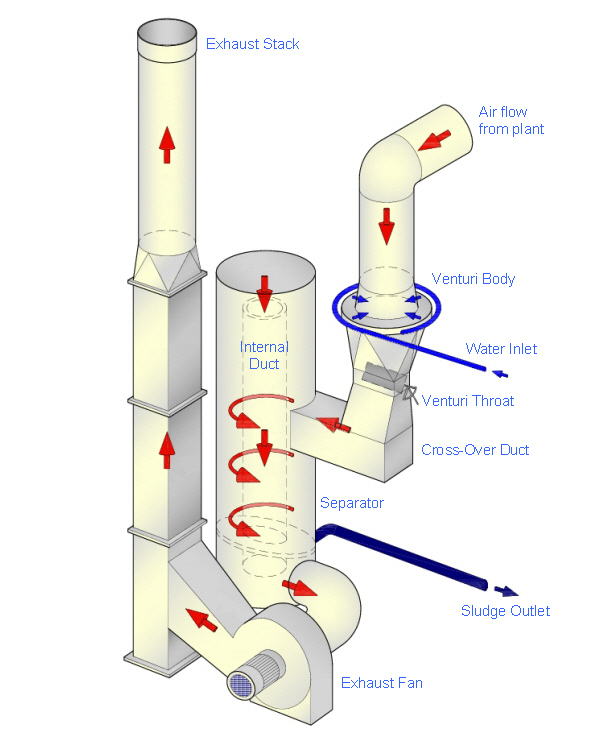 The remainder would then pass to the venturi scrubber where water is introduced into a venturi section. The exhaust gases are accelerated up to high velocity causing the added water to atomise into very fine mist particles. The dust particles in the exhaust gases mix with the fine water droplets producing a sludge. The sludge is then separated out in a centrifugal chamber and passed to a lagoon, filtering press, etc. The final emission to atmosphere from venturi scrubbing plants in the minerals industry is around 100mg/Nm3 based on relatively low energy losses across the venturi throat (250mmWG). If lower emissions are demanded then additional electrical energy is required to allow the exhaust fan to develop a greater suction and therefore to increase the velocity through the venturi throat thus producing a higher pressure loss across the venturi throat and smaller water droplets.